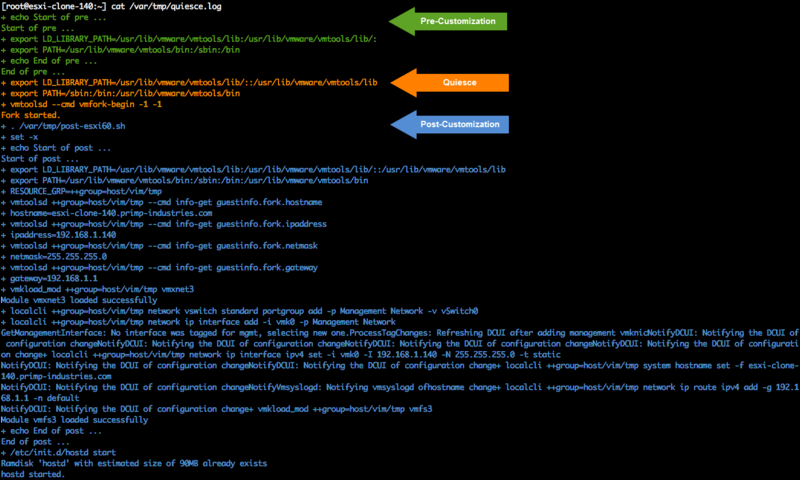 I was fortunate to have been given early access to the VMFork (Instant Clone) PowerCLI cmdlets to help provide early feedback and usability improvements before it was released to customers. Having spent some time with the Fling, I have learned a thing or two about how Instant Cloning works and some of the caveats or gotchas while creating the customization scripts that are used as part of the Instant Clone workflows. I wanted to put together a quick reference on some of my findings as well as well as other recommendations from Engineering who have worked closely with the Instant Clone feature. The idea is to have this as a living document which I will update as new tips and tricks are identified. Additional custom variables can be passed to the post-customization script by adding to the -ConfigParams array of variables. A Forked Child VM will also have a duplicate MAC Address which needs to be updated as it is not automatically picked up. You can either manually set it by retrieving the guestinfo.fork.ethernet0.address with the post-customization script. If you plan on downloading or installing additional software packages on the Parent VM, it is recommended that you perform that operation directly in the VM and not within the pre-customization script. I have noticed that if pre-customization takes too long, the quiesce operation eventually fails even though the operations within the pre-customization script executed successfully. To ensure Forked Child VMs do not contain duplicate disk ID's from Parent VM such as setting up a VSAN environment using Instant Clone Nested ESXi, add the disks after Forked Child VMs have been created. For additional OS Customization Scripts, be sure to check out the Instant Clone community customization script repository and consider contributing back scripts that you have developed.